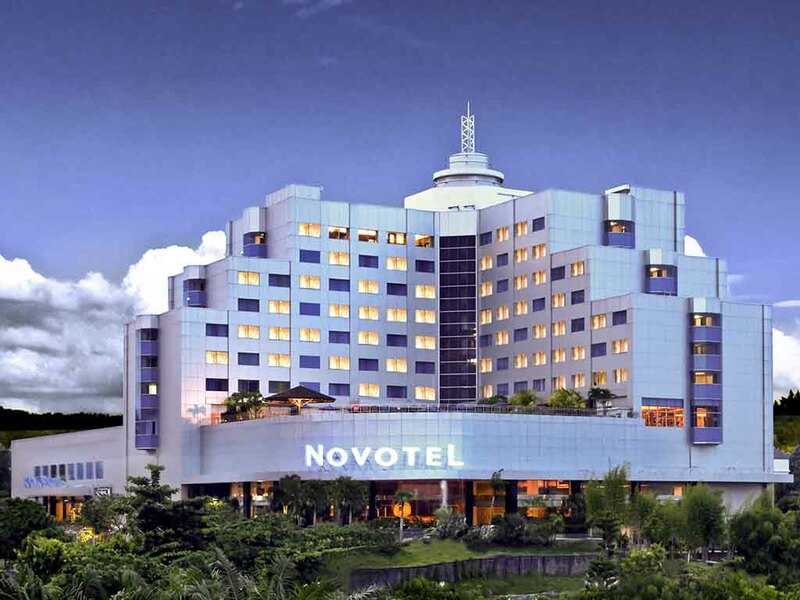 Check in to Novotel Balikpapan, a 4-star contemporary hotel in the centre of Balikpapan. This Indonesian hotel is an excellent choice for business and leisure. Enjoy a relaxing massage and a dip in the jacuzzi or outdoor pool. A range of bars and restaurants with exceptional views guarantee you will make the most of your stay at Novotel. Novotel Balikpapan is the first International Hotel in Balikpapan. The hotel is strategically located in the heart of the city and easily accessible. It offers a complete range of facilities for both business and leisure travelers . Located in the heart of the business district, Novotel Balikpapan is just 20 minutes by car from the Airport, 5 minutes from the nearby shopping centers and 20 minutes from the Semayang Harbor. It is also only 200 meters from the seaside. Perfect place for apperitif and trendy music with tapas food. Open daily from 10AM to 1AM Located next to The Square and overlooking the sea. The perfect place to meet friends with wide variety of cocktails and snacks. I love Novotel because I only book for superior room yet I can have experience to chillax in a bath tub!! the pillows were really comfort, and even a god view from the room. but please care more about the bathroom, I felt like the bathroom not so clean as I visited before yesterday, especially the bath tub. but overall I enjoy the night at Novotel Balikpapan. Thanks! Nice hotel with big spacious room and courteous front desk. Check in queve was long at 22.30 PM, drawer in room suddenly collapsed, electricity socket was not worked properly, staff friendliness was so so, phone in bathroom was broken, bath ammenities like 3 star hotel. I had experienced stay in novotel some time ago, and that time was great. Currently it goes down. I like the circumstances. The hotel is clean, enough spacing room, and you have Children corner! I love it, cos' my children can play on there. But at that time, I think the closet is not good. The water is slowly. About the menu in the restaurant when I do my breakfast, sometimes I feel bored, especially for the Prasmanan menu and I stayed for 3 nights. Hotel: Good Room: Good Staff: Polite and helpful only one unpleasant moment, at the pool there is no smoking spot, it was so disturbing when people can freely smoke near the pool, please consider to provide one. i booked the hotel as i though it would be the same as other novotel hotels. and the hotel was recommended by my colleagues. . the experience was just &quot;so so&quot; and the hotel looks very tired. the bathroom was yellowish. the service wise during the stay was very basic. the breakfast was tasteless, i think you should get your manager to taste the food before serving to the guests. i am talking about the overall food. but that was nothing compare to the experience i had after i checked out. i called the hotel on 15 Mar at 8AM to ensure that they will be able to send the hotel invoice for my room. There is no feedback, i believe my email address was there, that the reason I received this survey because you have my email address. I then asked my assistant to assist, he called at 5:30pm as there was no feedback. He was spoken with the AFOM as we want to ensure there should be followed up on my request as I need the invoice urgently. I understand that the room price should not be appeared in the room guest folio, then you guys should issue the guest folio that only stated the date of arrival and departure, as we need this to be submitted. We keep explaining how they can do, but still they asked us to check the email, they even got the wrong email address, in-spite of repeating and spelling the email address by international alphabetical code. I just think, the staffs and even manager need to be trained on how handling this kind of situation. Not having the guest keep calling and repeating what they wanted. Staying at Novotel Balikpapan is always feel welcomed. Started from the airport, the driver was there upon my arrival, taxi to the hotel with light conversation inside and at the front lobby a security guard with smile. Receptionist was ready with everything, get the keys and straight to the room and rest for the night before ready back to business again in the morning. Hi, I am sorry but this was the worst Novotel experience I have ever had. As a long time customer of Accor hotels, I will not put any feedback on my trip advisor account hoping to see improvement next time. The downloghts were full of dust and did not look clean and gave the whole impression of a not clean room. My bath had blocked drainage and when I showered the water stayed for long time which was geoss (room 616). The elevators must have been very old. They were super slow and long wait time going up or down. I hope there are improvment on my next visit. Regards Ali K.
Clean and comfortable room, suitable for me to get the rest after work. The hotel's room is clean, neat and spacious. It has beautiful view to the sea. The staffs are friendly. I really enjoy my stay. It was a nice, good welcome and good check out. Efficient. The bedroom could have had more choices for minibar.